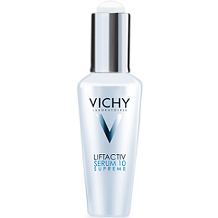 Vichy says its eyelash serum will strengthen, smooth, illuminate and fight wrinkles around your eye area, which is the part of the face prone to aging the most. The company assures you of a more youthful, wide-eyed appearance with its Liftactiv Serum 10 Eyes & Lashes, which forms the subject of our review today. Regarding your eyelashes, it promises to strengthen and condition your eyelashes. Hyaluronic acid is clinically proven as a superior moisture barrier which retains moisture 1000 times better than most other products. This hydration is key to plump looking skin. Ramnose is a naturally derived plant sugar that improves your skin structure on many levels. The mineralizing water is rich in 15 minerals from a volcano-rich area which further hydrates your skin. It is clear that the formula focuses on hydration and sealing in this moisture, effectively conditioning both your eye contour area and lashes. But a one-size-fits-all product for both the eyes and lashes doesn’t target either area as effectively as science allows. To lengthen, thicken and condition your lashes, we would have expected to see key ingredients which have been widely researched as being top for achieving this. These include Vitamin B5, Vitamin E, Marula oil, Pea Sprouts and more. The manufacturer recommends that you use this twice a day. Apply one drop of serum to your fingertips. Then, close your eyes and massage into your eye area, finishing with one swipe from your inner eye corners outward, touching your lashes. You’ll pay $35 for a 0.51 oz wand. Purchases for over $60 qualify for free gifts. Other than this, there are no discount incentives, for example, for buying multiple wands. You must return products within 30 days, and empty products cannot be returned. You are responsible for pre-paying for the return – and it may even be that you are paying not just to send the product back, but for the new one to be shipped back to you. For a big international brand, in particular, this 30-day return policy is not generous compared to other cosmetic manufacturers who are offering anywhere from 60 days to 365 days in which to file a return request, depending on the product. We have found a direct correlation between how well the product works, and how long you have in which to return it. It may well be that Vichy does not test its products on animals but it does not expressly make this claim, nor does it overtly state that it moves forward in formulating products with mainly natural products in mind. We liked the inclusion of Hyaluronic Acid as a key hydrating agent. As for the mineral water being rich in minerals and vitamins, hopefully, this includes vitamins B5, E, and resveratrol as those are key to eyelash growth and strength. They are not mentioned, so there is no way of knowing. Neither can we know in what quantities they are included and if at least 10% of the ingredients in this serum are active as a result – 10% active ingredients is the minimum you want to look for in order to know that a serum will be effective, and is not filled merely with emulsifiers. The major problem here though is: Is this an eye cream or an eyelash serum? In our researched opinion, one product cannot effectively target the eyes and lashes effectively, as different clinical ingredients are shown to work for each. With these ingredients such as Marula oil and more missing, and in the absence of patented ingredients to compensate or proven to work for both the eyes and lashes, what this serum is trying to achieve cannot be done. At best, you are gaining notable hydration properties for your eye area but still missing collagen and key antioxidants, and a moisturizer for your lashes. There does not appear to be anything in this formula deeply targeting lash growth and lash strength.